Companies like Toyota are helping us create exciting new apprenticeships relevant to a range of industries. Toyota was one of the first companies to be involved in the trailblazer process back in 2013. Here, Trailblazer, Andrew Parsons talks about the reasons behind their involvement, how he’s been finding the trailblazing process, the challenges that could arise in the future, and why other employers and industries should consider getting involved. How did Toyota first become involved as a Trailblazer? 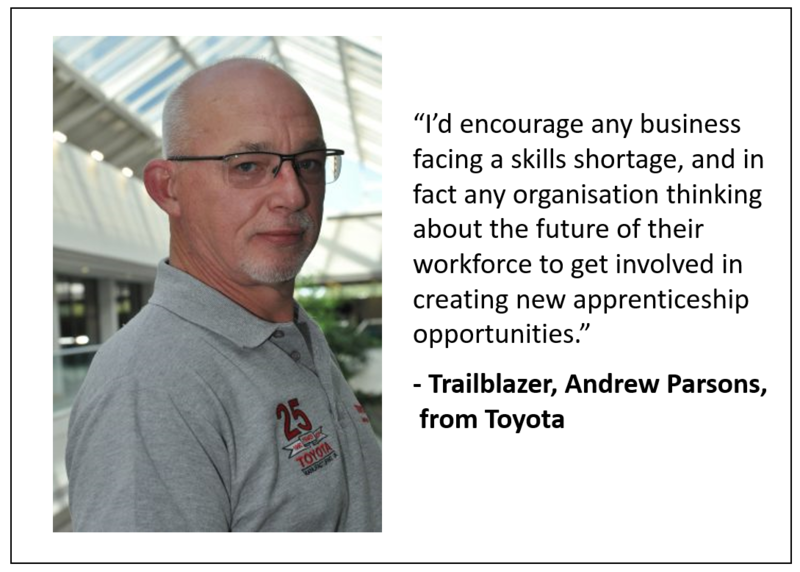 Back in 2013, when the Trailblazer concept was first initiated, Toyota Manufacturing UK was already working with the Automotive Council on a strategy to develop stronger apprenticeships. When we were first approached about the Trailblazers, we already knew we wanted to help form the future of apprenticeships, so we were keen to come on board. We were one of the founding eight Trailblazer groups. Why did you support this process so strongly? We firmly believe that it is employers who can really determine the needs of the industry, and thus the ‘training needs’ for apprentices in our Industry. We had already implemented a high standard apprenticeship programme, so it was a natural step for us to get involved with Trailblazers. Are the skills being taught in the new apprenticeships only relevant to your industry? Not at all. The new standards will encompass a full skillset rather than a specific ‘job’. So these apprentices will be learning transferable skillsets that are used by industries such as food and drink, retail, distribution, aerospace and maritime - to name but a few. Do the apprentices you train already generally end up working for Toyota? Some do, however we also train apprentices for organisations in other industries, and our supply chain. This includes local SMEs who supply us with wheels and tyres, seats, carpets and fuel tanks. And of course, they may well supply parts for other automotive manufacturers all around Europe. So our apprentice scheme here goes much further than just Toyota. Our training has developed a really strong reputation over the years, and because of this we now work with 32 partner companies, providing them with their Apprentice needs. 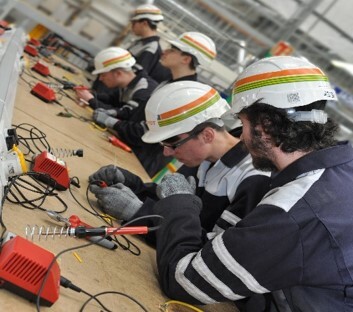 Do you think things are improving for employers taking on apprentices? Absolutely, on a number of levels. Firstly, in terms of funding, previously the provider wasn’t able to access all funding available, so the employer had to cover the additional costs, but thankfully this is changing. And of course, in terms of the outcomes of the apprenticeships themselves. Through the employers designing the programmes, we are able to ensure that all apprentices come away with the core skills necessary to succeed within their target industry. This means a much higher calibre of apprentice who is work ready. How have you been finding the Trailblazing process? As with any new initiative, there is always a learning curve. Working with government departments and other organisations on a totally new project, we always expected the occasional change of tack, but now the Institute for Apprenticeship has been established, we look forward to the direction ahead. It’s exciting because now we have a chance to help influence and drive the development of a process that everyone is happy with. So what challenges lie ahead? I’d say there are three main challenges ahead of us. Firstly, ensuring the consistency of our standards and making them relevant across different sectors to minimise dilution of content and avoid a confusing proliferation of standards. Secondly, ensuring the End Point Assessments are also consistent, meaningful and fair whilst reflecting the actual job content of the apprentice, not just what can be taught in a training school. And finally, ensuring we have a talent pipeline ready for development in the future. We want to be inspiring young people into hands-on careers in STEM subjects, so at Toyota Manufacturing UK, we are working with local schools to try to maintain an enthusiasm for engineering career opportunities. How does the industry in general feel about apprenticeships? I’m lucky to work in a sector that strongly supports quality apprenticeships. But all sorts of parties have shown an interest in our particular standards. This includes other car companies but also retailers, technology companies, and those involved with the military. How important do you think quality apprenticeships such as yours are to the future of UK industry? Along with other industries, we recognise that in the future there will be a skills shortage in certain areas. It is our work with apprenticeships that will enable us to fill these gaps. We have come to realise that if we don’t act now we will suffer in the long term. I’d encourage any business facing a skills shortage, and in fact any organisation thinking about the future of their workforce to get involved in creating new apprenticeship opportunities. We’re committed to ensuring that these standards remain excellent, and will support the Institute for Apprenticeships to that end. After all, the responsibility for quality apprenticeship standards now lies with the Institute, as does the responsibility for making an overall good process to create new standards. Anything we can to do help work towards these goals would be good for the UK. Read the first part to this series where Andrew Parsons talks about the specific skills apprentices will learn during these apprenticeships.